As discussed in my August 22 post, the person in search of historical truth relative to mediums and paranormal phenomena may very well be confused if he or she relies on Internet references. In that post, I offered the example of Leonora Piper, made out to be a “clever charlatan” by Wikipedia even though the four primary researchers who extensively studied her trance mediumship, all representing the Society for Psychical Research (SPR) or American Society for Psychical Research (ASPR), were convinced that she was a genuine medium, one relaying messages from the spirit world. It is a work in progress, edited by Robert McLuhan, a British freelance journalist and the author of the 2010 book, Randi’s Prize, but it’s off to a good start, including a factual and balanced treatment of Mrs. Piper. Another good example of the differences in treatment of a medium is the “bio” of Henry Slade. 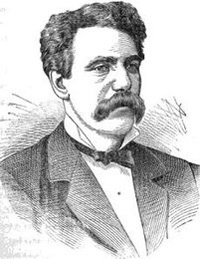 Wikipedia begins by stating that “Henry Slade (1835-1905) was a famous fraudulent medium who lived and practiced in both Europe and North America.” It then goes on to say that “according to Joe Nickell,” he produced his phenomena by a variety of magic tricks. After Nickell, Karen Stollznow is quoted as to how Slade tricked people. It should be noted that Nickell was born in 1944, 39 years after Slade’s death, and Stollznow in 1976, 71 years after his death. One is left to wonder if they witnessed Slade (below) in a past life or perhaps from some celestial perch before being born this time around. The Wikipedia biographer later calls upon Harry Houdini, the great magician, who said he knew someone to whom Slade confessed he was a fraud. Wow! Houdini knew somebody who had the inside scoop. How evidential is that? What is not said and is drawn from another reference is that Frederick Powell, a fellow magician, told Houdini that he observed a levitation, movement of furniture, dematerialization of an object, and a slate snatched from his grasp by unseen hands, with Slade, and though convinced it had to be trickery of some kind, he could not explain it. 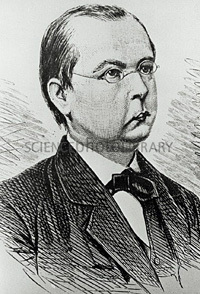 The SPR biography begins: “Henry Slade was a controversial nineteenth century séance medium who was publicly accused of fraud, but who was also reported to have produced striking psychokinetic phenomena under well-controlled conditions.” Much of the write-up is based on experiments with Slade carried out by astrophysicist Johann Zöllner at the University of Leipzig. Professor Stephen Braude, who wrote the SPR entry, notes that Zöllner had more than 30 sessions with Slade, occasionally with the aid of prominent colleagues, including Wilhelm Scheibner, professor of mathematics, Wilhelm Weber, professor of physics, and Gustav Fechner, professor of physics and pioneer of the new science of psychophysics. Although Slade was most known for his slate-writing (spirit communication on small chalk boards), Zöllner was more interested in the psychokinetic aspects – moving objects with the mind (or spirits moving the objects?) – and reported various phenomena, including the penetration of matter by matter, apports, involving the disappearance and reappearance of objects, the movement of a filled bookcase at some distance, the tying of knots in untouched endless cords, materialized hands, and an accordion playing with Slade holding just one end of it. But, according to Wikipedia, Zöllner (below) observed Slade on just “several” occasions, and “Slade failed some of the tests carried out under controlled conditions but still succeeded in fooling Zöllner in ‘several’ other attempts.” My definition of “several” has it at much less than 30 and there is no explanation as to how it was established that Slade “fooled” him. Clearly, the implication is that such phenomena are not real and therefore it had to be a trick, no other explanation possible. So much for objective reporting. The Wikipedia bio also mentions several other people who claimed that Slade was a trickster, but, as with other mediums, many of these “one-time only” sitters who claim fraud apparently jump to their conclusions by assuming that the phenomenon witnessed is not humanly possible and therefore what they saw had to have been a trick, even if like Powell, they didn’t understand it. Other skeptics explain to them that the deception “might have been” or “could have been” done a certain way, and this reinforces the idea that it was a trick. All these speculations on how the trick “could have been” or “might have been” carried out become part of the historical record associated with the individual medium and are then carried forward by other biased and ignorant historians. Sadly, the testimonies of the fly-by-night observers are seemingly given equal or even more weight than those of the researchers who sat with the medium multiple times under strictly controlled conditions. As mentioned in the prior post on Leonora Piper, Dr. Richard Hodgson studied her for 18 years, observing her on the average of three times a week for nearly all of those 18 years, while Sir Oliver Lodge, a world-renowned physicist, sat with her 83 times during her first trip to England. Cambridge scholar and SPR co-founder Frederic Myers and Professor James Hyslop also had numerous sittings with her. All four were convinced that she was a genuine medium through whom the spirit world was communicating. Yet, Wikipedia dismisses those four men in a few sentences and gives the preponderance of weight to debunkers who never observed her and just speculated on what took place, or those who just sat with her a time or two and had no clear understanding of the dynamics of mediumship. While the Wikipedia biographers of mediums clearly embrace the negative reports by the fly-by-nighters, appear to go out of their way to avoid the positive reports, those lending themselves to the reality of mediumship. For example, Frank Podmore, one of the arch-skeptics of the time, claimed to be “profoundly impressed” by Slade. He is not mentioned by Wikipedia relative to Slade, although Wikipedia is quick to quote him with other mediums who did not impress him. And then there are times when even the best of mediums fail to produce anything. The one-time sitter sees only failure, which translates to fraud. The researchers who studied Mrs. Piper for nearly two decades reported that there were many times when she could not achieve the trance state necessary for phenomena to be produced. Likewise, Slade apparently had days on which nothing happened. It may be that when nothing happened, he tried to make something happen so as to not disappoint the observers; that is, he cheated. Once a cheater, always a cheater, is the emotional conclusion in such a case, not necessarily the rational conclusion. Then again, so many allegations of cheating seem to have come from observers who have mistaken an ectoplasmic arm or hand, as produced by spirit entities, for the medium’s arm or hand, or have not considered the possibility that the actions of spirits are being construed as cheating by the medium, i.e., whether it is “conscious” fraud or “unconscious” fraud, the latter not really being fraud, per se. The whole issue of spirits being involved with the phenomena of the mediums presents something of a Catch 22 situation for the researchers and complicates the biographies, at least for those biographers who want to be “scientifically correct.” In effect, they can’t hypothesize spirits because the strong evidence that spirits exist is not accepted by scientists, at least the fundamentalists of science. So spirits, or discarnates, never really enter the discussion. Even Braude, in his SPR bio of Slade, steers clear of the subject, mentioning the “spirit communicators” that wrote on Slade’s slates, but this phenomenon, Slade’s primary phenomenon, is quickly passed over by Braude without any real explanation as to what went on in the slate writing or whether anything of evidential value came from it. Other references, not restrained by a need to be “scientifically correct,” do suggest that there was evidential value in the slate writing. As for the psychokinetic phenomena – the movement of objects without the aid of human hands – the reader is seemingly left to assume that it is either fraud or mind over matter. “Materialized hands” are mentioned by both Zöllner and Braude, but no attempt is made to link these hands to spirits or to suggest that the spirits are the ones moving things about. That would be too “unscientific” and might invite scoffs, sneers and sanctions from those fundamentalists of science. While the very word “medium” suggests an intermediary between the material world and the spirit world, the man of science must tread lightly in this area and avoid it as much as possible. Fortunately, the researchers of old, such as Hodgson, Lodge, Myers and Hyslop were not so restrained in this regard, though they were well aware of the alternative explanations for various phenomena. I could find nothing to indicate that Slade was a trance medium, only that he was in a “passive” state when phenomena came about, and therefore it is difficult to say whether unconscious cheating is a defense for him, assuming that cheating, per se, was really involved. Reading beyond both the Wikipedia bio and the SPR bio though, there appears to be quite a bit more on record about Slade that is not said, probably because it all seems to be opinion or speculation by casual observers who really didn’t understand what was going on. However, there were more informed people, like biologist Alfred Russel Wallace, co-originator with Charles Darwin of the natural selection theory of evolution, and Serjeant Cox, a well-respected London barrister, who were convinced that Slade was a genuine medium, and there were some, like Eleanor Sidgwick, a prominent member of the SPR, who believed he was a fraud. Such is the complexity of separating fact from fiction in many types of mediumship. A small group of professors referred to as the Seybert Commission studied Slade in 1884, five years after Zöllner and his group of professors did. Slade is said to have left them believing that he had given them ample evidence of his mediumistic ability; however, after receiving testimony from magicians and psychologists, the commission concluded that what they witnessed was nothing but trickery. It seems only reasonable that the primary references in such cases should be the scientists and academicians who thoroughly studied the person – the Zöllner group in the case of Slade and Hodgson, Lodge, Myers and Hyslop in the case of Piper. Such men and women are the primary references in the new SPR encyclopedia, not the casual observers or those who never even witnessed the biographical subject. As I see it, the Wikipedia biographers of mediums are like the teenager who was told by his parents that smoking is bad for his health. “But grandpa is 60, an old man, and he still smokes,” was his justification for continuing to smoke. One of the effects of the near-death experience (NDE) often reported by experiencers and researchers is a transformation from a materialistic way of life to a more spiritual one. 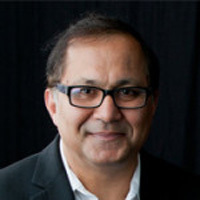 I have read accounts of scores of such transformations over the past 40 or so years, but I can’t recall any that exceeds the transformation experienced by Dr. Rajiv Parti, (below) as related in his recently released book, Dying to Wake Up: A Doctor’s Voyage into the Afterlife and the Wisdom He Brought Back. As the head of anesthesiology at the Bakersfield Heart Hospital in California, Parti enjoyed a very luxurious lifestyle. “My goal was bigger everything – house, cars, art collection, bank accounts,” he tells his story, further mentioning that he looked forward to graduating from a Porsche and a Hummer to one day having a Ferrari in his garage, and that at one point during his 25 years at the hospital he took a nine-month sabbatical in order to trade on the stock market, sometimes making a million dollars in one day, but then losing it just as fast. He lived in a neighborhood of “mini-castles,” each one designed to match the image the owner wanted to project. Driving through his neighborhood, Parti recalls, was like a spin through Disneyland. “The community was hermetically sealed, safe from the outside world, and I had come to believe that meant safe from physical illness as well.” Doctors don’t get sick, he had come to believe. But reality soon hit home, first with a diagnosis in 2008, at age 51, of prostate cancer, followed by surgery and various complications, including incontinence, impotence, and a dependency on antidepressants. There were five more surgeries and then an infection around an artificial sphincter, filling his abdomen with pus. It was during the surgery, in 2010, to clean out the infection that Parti went out-of-body. He recalls going up toward the ceiling, then looking down at the surgeons and nurses, and being mesmerized by the scene below him. Then something happened which Parti did not understand. “It was as though my field of vision became much wider and my consciousness expanded well beyond whatever it had been before, as though all of my senses had the ability to see, and what they saw could easily be different scenes,” he explains, going on to say that he dropped in on a conversation between his mother and sister in New Delhi. He later verified the conversation with his mother and the clothes they were wearing. After a feeling of deceleration, Parti found himself in the recovery room, where the fellow anesthesiologist was there to welcome him back to consciousness. When Parti attempted to tell him of his out-of-body experience, the anesthesiologist appeared disinterested. As evidence of his experience, Parti told the anesthesiologist that he overheard his off-color joke during the surgery concerning the odor of the pus. The anesthesiologist responded that he must not have given him enough anesthesia. Having monitored the anesthesia and knowing how much he had received, Parti informed him that he had given him enough and attempted to tell him about other aspects of his NDE; however, the anesthesiologist appeared uncomfortable and excused himself. The surgeon reacted similarly when Parti tried to relate his experience to him. Other doctors, his colleagues, reacted with similar indifference, even antipathy. Parti recalled that some of his patients had tried to tell him of their out-of-body experiences and meeting departed family members during surgery, but he was always too busy to hear them out. Now the shoe was on the other foot and he didn’t like it. As Parti interpreted it, he was a victim of karma – you reap what you sow. As you might surmise at this point, Parti gave up his medical practice, downsized his house and cars and began learning to live with less. His wife, a dentist, supported him in his new pursuit. “In a matter of months, we had confronted our materialism and won,” Parti states. “By talking rationally and separating our needs from our wants, we had changed the nature of our egos by 180 degrees. Rather than needing more to feel good about ourselves, we discovered the wisdom of less….” Parti is now practicing “consciousness-based healing,” which is grounded in meditation.